NestopiaX v2.2 is released. 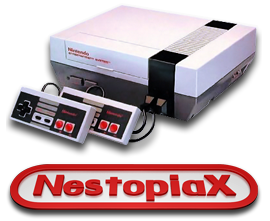 NestopiaX is a NES emulator for the XBOX. This is a port of the pc NES emu nestopia and is now the best NES emu on XBOX. It also plays the famicom disc system games at full framerate. 1.) Added the ability to set the ram power on state of the emulated NES. This affects games like River City Ransom's start up enemies and other games. By default a real NES used random values to flush into ram on startup. Nestopia still defaults to 0XFF. To toggle the settings, go into general options while in game and set the state to random and reset to hard and Nestopia will flush ram like a real NES did after resetting. 2.) Added the option to emulate the famicom Mic. Most famicom and FDS games did not utilize the mic but some games like the zelda FDS version utilized the mic to kill pols voice. The option can be found in controller options in general settings. You can set the simulation of the noise of the mic to the xbox dpad. Press it repeatedly to simulate sound into the mic. 3.) Added support for the Bandai Hypershot for games like space shadow. It is integrated with the lightgun support, so set controller 1 to gamepad and controller 2 to lightgun. Button a on the xbox dpad is to shoot, and B moves the character forward after killing an alien. Button b also throws a grenade while fighting an alien. This will be cleaned up in the future but for now, Bandai Hypershot games are now playable on xbox. Note: Lightgun games are not compatible with the NTSC filter. 4.) Correct and accurate emulation of the MC-ACC mapper. Games like Mickeys safari in letterland and others now play accurately. 5.) Lutter FDS Was freezing, fixed! 6.) Blaster master pimp your ride was not working correctly, FIXED!